This week's show is mostly monologue. 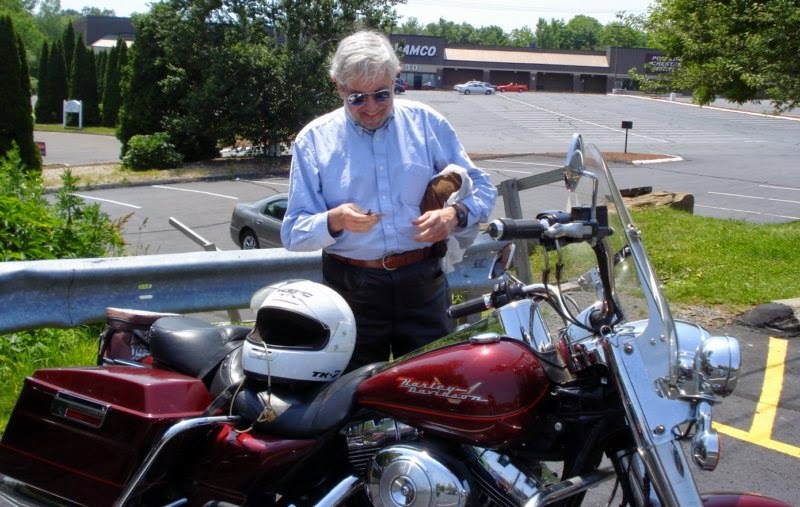 It's an extended "personal essay" by me, more or less in the tradition of Blue Highways and Zen and the Art of Motorcycle Maintenance. With I guess a few echos of "News From Lake Wobegon." It's about authenticity and its opposites. It's also about motorcycle design, and simplicity versus clutter, and the rebirth of the "Indian" brand, and the quiet, subtle virtues of a Harley-Davidson. It's about how New England place-names sort of begin to make sense after you've lived here 20 or 30 years. It's about corporate franchises and their phony food and their phony architecture--including fake gables, fake windows and even fake "widow's walks." And it's about taking a motorcycle to search for "the authentic"--and sometimes even finding it when you get far enough out of town. Uncasville, maybe. Top: Mel's Diner, Uncasville, Connecticut, January 2, 2015, by Kenneth Dowst. (Copyright. Creative Commons license: Attribution--Non-Commercial.) The diner is discussed in this installment. Above: K.D. and H-D Road King. Photo by Barry Pinkowitz.